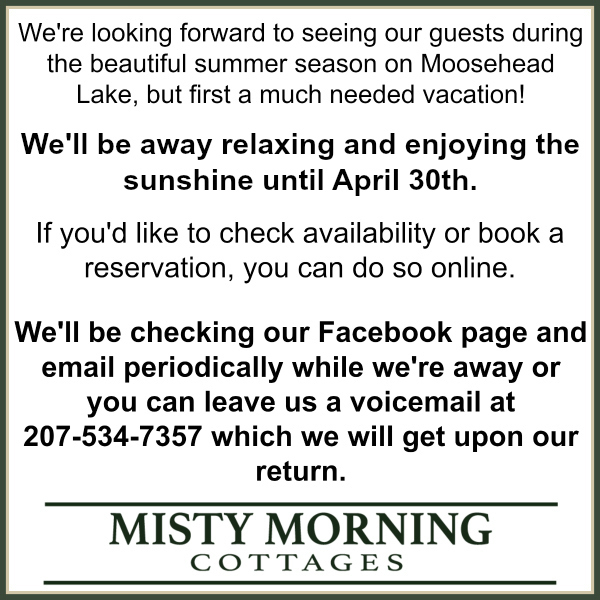 We’re thankful for your interest in booking an upcoming stay with Misty Morning Cottages at Moosehead Lake! Below you’ll find important information regarding staying with us at MMC, please be sure to read through and contact us if you have any questions. If you have never stayed with us before there will be a $100 security deposit due at time of check in. This security deposit will be refunded within 48 hours of your check out provided that a) there are no damages and b) that the cottage is clean following your stay. The rates for Cottages 1, 2, 3, 4 & 5 are for up to 4 adults. If your party should include more than 4 adults there will be a $35/night per person fee added at time of check in and possibly will require the rental of an additional cabin if one is available. Only Cottages 1-3 are pet friendly. There is a $25 pet fee per stay charge for 1 dog and $50 for 2+ dogs per stay. If you reserve a pet free cottage and arrive with a pet we reserve the right to refuse your stay and your deposit is not refundable. We do require that pets are to be leashed when on our property and pets left unattended in our pet friendly cottages be crated while you’re away. Please note: as per our insurance we can not have Pit Bull/American Staffordshire Terriers at our cottages. The rate for Cottage 6 is for up to 2 adults. If your party should include more than 2 adults there will be a $35/night per person fee added at time of check in and possibly will require the rental of an additional cabin if one is available. Children are not to be left unattended in the cottage, in the water or on the property. Guests are responsible for washing all dishes and ensuring their cottage is neat and tidy prior to their departure. Please note our cancellation & refund policy below. Upon payment for your reservation you’re acknowledging and agreeing to the cancellation & refund policy listed above. I will take cabin number three the 9th of February through the end of the week. I would like cabin 5 for August 23 and 24th 2019. Could you please confirm that you received my reservation for Cabin 4?